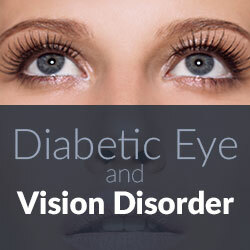 Diabetes is the leading cause of vision loss for Americans under the age of 74. More than 20 million people have diabetes – and more than 6 million don’t know it. Nearly all those with diabetes will develop some form of diabetic retinopathy, 40% will suffer from glaucoma and 60% will get cataracts. In honor of November being American Diabetes Month, the California Optometric Association is reminding Americans with diabetes about the importance of scheduling annual, dilated comprehensive eye exams to help detect and even prevent eye and vision disorders that could lead to blindness. Since the eye is the only place on the body that blood vessels can be seen without having to look through the skin, an eye doctor is able to examine the retina for early warning signs of diabetic eye disease and prescribe a course of treatment to preserve an individual’s sight. People with diabetes are at a significantly higher risk for developing eye diseases including neovascular glaucoma, cataracts, microvascular cranial nerve palsies and diabetic retinopathy. 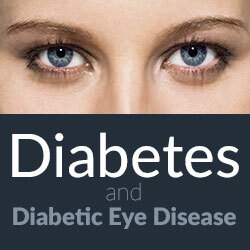 Diabetes accounts for approximately one-third of cases of neovascular glaucoma. Neovascular glaucoma is a rare type of glaucoma that often results in visual loss. Neovascular glaucoma can occur when new blood vessels grow on the iris, closing off fluid flow in the eye and raising the eye pressure. It can be very difficult to treat, which is why those with diabetes should get their eyes examined on a regular basis. In addition, people with diabetes are 60 percent more likely to develop cataracts, which is a serious condition that causes the eye’s lens to cloud and interfere with normal vision. Cataracts is a condition that tends to develop at an earlier age in people with diabetes. Those with diabetes are also more at risk for developing microvascular cranial nerve palsies. Microvascular cranial nerve palsies involve the small bloods vessels that affect the muscles that move the eyes. Symptoms of this condition include not being about to move the eyes in different directions, causing double vision or droopy eyelids. Those with diabetes are at a 7.5x higher rate of suffering from cranial nerve palsies than those without diabetes. Another condition, called diabetic retinopathy, is a condition occurring in persons with diabetes that causes progressive damage to the retina, the light-sensitive lining at the back of the eye. Diabetes interferes with the body’s ability to use and store sugar and too much sugar in the blood can cause damage to the eyes. Prolonged periods of high blood sugar can lead to the accumulation of fluid in the lens inside the key that controls eye focusing. This increased fluid causes the retinal tissue to swell and can lead to blurred vision. Advanced stages of diabetic retinopathy can lead to permanent vision loss. The longer you’ve had diabetes, the more likely you are to have retinopathy, so it’s crucial to get your eyes checked regularly. 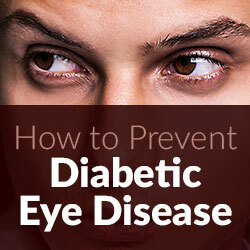 Early detection and maintenance is key to controlling the progress of diabetic eye diseases.